All the charts for the ‘Concubine Chronicles’ album – full score, tenor sax, guitar, Hammond B3, bass and drums chart were typeset by Phil Knight using the Reprise font he developed himself for Sibelius. The Bass charts are beautifully engraved and are very easy to follow. Musically there is plenty of room for improvisation – often the tunes have a vamp that loops, allowing the bassist playing along to the minus bass files to create their own variations on the sample pattern. As this was a live recording and all instruments were in the same room you will hear some bass ‘bleed’ on the minus bass tracks if you listen carefully. However, playing your bass on top of the backing track will make the ‘bleed’ disappear for most of it. As always, the KR Player’s highlight bar and scrolling mechanism will make sure that you will not get lost in the chart. If you want to work on tricky sections use the slow down facility and of course you can loop and desired section to either practise a tricky part or develop your own bass lines. ‘Concubine Chronicles’ , the Funkestra’s fourth album, was recorded in Mark Knopfler’s ‘British Grove’ studio in Chiswick and engineered and mixed by Rupert Christie. 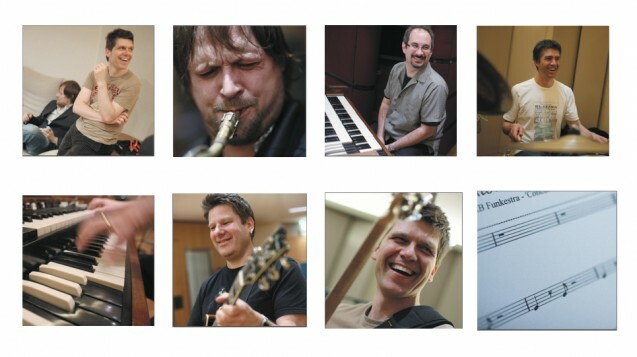 The players are Mike Sturgis on drums, Eran Kendler on guitar, Dave Limina on Hammond, Jim Hunt on tenor saxophone and Stefan Redtenbacher, the bandleader and writer, on bass. The album was recorded ‘live’ in the studio in three days. The idea to record together at the same time rather than ‘multi-tracking’, i.e. one player at a time, one after another. The idea behind this was to capture the raw energy of their live performances. Download the free KR Player for iPad here and download 8 FREE bass charts and syncing minus bass tracks.